As awareness and education around terpenes and aromatics continues to grow, so too does the level of debate about which ones are the best. As with any debate, there are two sides to the discussion and it should come as little surprise that both botanically and cannabis sourced terpenes have their virtues and drawbacks. Let’s unpack! Let’s start with the basics. The crux of what makes each option a fundamentally different product is the line between full plant extract and isolated terpene blend. When you conduct a full plant aromatic extract similar to what is done when capturing cannabis- or hemp-derived terpene profiles, you’re pulling nearly everything that influences the aroma and much of the flavor within the material. This not only includes upwards of hundreds of terpene isolates but also esters, flavonoids, and alcohols. Whether it’s a prevalent monoterpene such as Myrcene or trace amounts of pungent esters, each compound leaves its mark and influences the entourage effect. Botanically derived blends are crafted using terpene isolates sourced from non-cannabis plants such as lavender (linalool), clove (myrcene) and pine needles (alpha pinene). These isolated terpenes are the building blocks of aroma and effect which is to say, linalool derived from cannabis or lavender is indeed the same. Well, except for cost. Pine needles are far cheaper than cannabis and hemp. To craft a profile using terpene isolates, aromatic chemists and formulators often use a recipe dictated by detailed plant analytics in tandem with their own expertise to craft a representative flavor and experience. While full plant extractions gather each and every compound fairly quickly, botanical blends are limited to the details provided by plant analysis technology and laboratory formulation time. Botanically derived compounds have advantages in customization and standardization. In undiluted form, both are extremely potent and effects-laden. Do you need cannabis or botanically derived terpenes? sales@trueterpenes.com is here! Upon digesting the information above, it is obvious that a full plant aromatic compound extraction is going to have a much more favorable representation of the host plant. For pronounced cannabis flavor, cannabis derived terpene compounds are the undisputed champion. Period. This is not to say that botanical terpenes can’t also add a great full-spectrum flavor and effect to your products as well. In fact, it’s far more likely that you have been consuming flavors built using botanically sourced terpene blends if you partake in THC or CBD vape pens or other products fueled by cannabis concentrates. We’ll explain why below but it’s important to understand the market’s impact in what kind of flavor is most suitable for your products. Remember when nicotine vape first came on the scene? Tobacco flavors were the majority and fruit, candy or floral flavors were scarce. Skip ahead a few years and we see a complete reversal. One of the biggest trends we are seeing as a company is the demand and use of non-cannabis flavors in mass-market cannabis products. This is where things get really tricky. Botanically derived terpene blends are fairly consistently priced with decreasing per mL expense based on larger volumes. To determine value, the purchasing agent should consider some basic parameters such as purity, packaging, potency, freshness and whether the terpene blends have been analyzed by a reputable lab. Cannabis or hemp derived terpenes are often graded by the extractor or a third party generally on a A+ to C scale. Without a widely adopted grading standard, much of this quantitative value is actually based on a qualitative assessment based on the undiluted aroma. Determining value is a matter of finding a batch that fits the aromatic profile you’re looking for and ensuring it is undiluted and available in the proper quantity. From there, negotiating price can be a fluid process as scarcity and cultivation costs can vary greatly from source to source. For reference a smaller volume purchase of botanical terpene profile will cost around $8-10/mL whereas a similar volume purchase for grade-A cannabis terpenes will cost closer to $150-$180/mL. A sizeable difference. We’ve mentioned scarcity and seasonal supply a couple of times already with regard to cannabis derived terpene compounds. The largest determining factor of how far cannabis terpenes can go is how much of the material was produced and then how many aromatic compounds it yielded. Once it’s gone, it’s gone. In most instances, this is not a scalable solution. On the other side of the equation, botanically sourced terpene blends are highly scalable due to the high volume of non-cannabis plant material available. Spill a liter on the floor and it’ll hurt plenty, but it’s not the end of your product line. Simply order another batch and move forward. This also means that there are immense opportunities to take advantage of economies of scale. Position your business to purchase larger volumes and watch your per mL cost plummet well below the $8-10/mL mentioned above. Depending on your local laws, the viability of using cannabis derived terpenes can be very cut and dry. In states such as California, the trade and transfer of cannabis derived products is limited to within its borders. Never assume that because a product does or does not contain cannabinoids that it is not governed in the same way. Terpenes are a significant investment, especially cannabis derived and if they’re not significantly considered, your business model can evaporate faster than monoterpenes in a hot oven. We’d just hate to see your new CBD pen with a national distribution strategy get stuck in your home state because your cannabis terpenes can’t leave. Food grade terpenes derived from botanical sources can be traded across state borders and exported to most countries. True Terpenes currently ships to over 20 countries and nearly every state including Alaska and Hawaii. Like fine wine, fine cannabis is a singular experience. An amazing one-time show. Vintage, even. However, this also means that once the grow has been consumed, it’s gone forever. A challenge curators run into when crafting a premium experience fueled by cannabis derived terpenes is the ability to sustain the same product taste and features from season to season. As indoor grows continue to become more prevalent, this may be easier to manage, but for the time being, cannabis derived terpene products are nearly impossible to maintain in terms of consistency. While it’s true that other plants also can undergo change from grow to grow, the foundation of botanically derived terpene blends is isolated terpenes. When you’ve drilled down to the molecular level to build your aromatics, it becomes very simple to maintain sustainable profiles. For our company, this means that our profiles only change when we decide it’s time to reformulate or otherwise improve a blend. This gives you ultimate control over quality and consistency. When producing vape products, there exists a conundrum with regard to cannabinoids and terpene yield from your material. Essentially, they compete with each other. Plant material that is rich in high quality terpenes is very likely going to yield lower THC or CBD levels. Why does this matter? Consider you are producing distillate pens and wish to first extrapolate the amazing terpene profile before turning the rest into isolated THC. Immediately there is a potential business issue here. Terpene-rich flower is very valuable and contains less THC by weight. Ideally, a product like this would not be used to make distillate at all as the THC yield will be lower – meaning less sellable product. Furthermore, high-end material such as this is usually found at lower quantities. Without getting too far into the weeds, it takes a lot of material to produce a meaningful amount of terpenes. It’s not unheard of, nor is it not recommended to go this path, but the end result is likely going to be a very delicious product with a high production cost that will carry a premium price tag. From a flavor perspective, terpenes derived from cannabis or hemp contain the most robust and complete flavor profiles. Simply put, this is the best cannabis flavor experience. However, whether it makes true business sense to use cannabis or hemp derived terpenes in your products completely depends on your cost models, production scale, and market positioning claims. At this time, botanical terpenes lead the way in terms of being cost friendly, infinitely scalable, standardizable, customizable, and free of the trade constraints associated with cannabis derived compounds while also maintaining similar characteristics, potency, and effect. So, if you’re looking to create ultra-premium cannabis products such as vape pens that are marketed toward a niche audience that prefers a pronounced cannabis flavor with the utmost connectivity to a specific profile strain, cannabis or hemp derived is the way to go! However, if your product line requires competitive pricing, large-scale distribution, and the ability to maintain a consistent and potent experience long into the future, the smartest business path is likely going to entail finding a fantastic botanically derived flavor solution. We hope this information helps you and your company navigate perhaps the toughest terpene choice out there. No matter which way you go, True Terpenes can help you source full-spectrum and full-flavor terpene profiles from both cannabis and botanically derived sources. 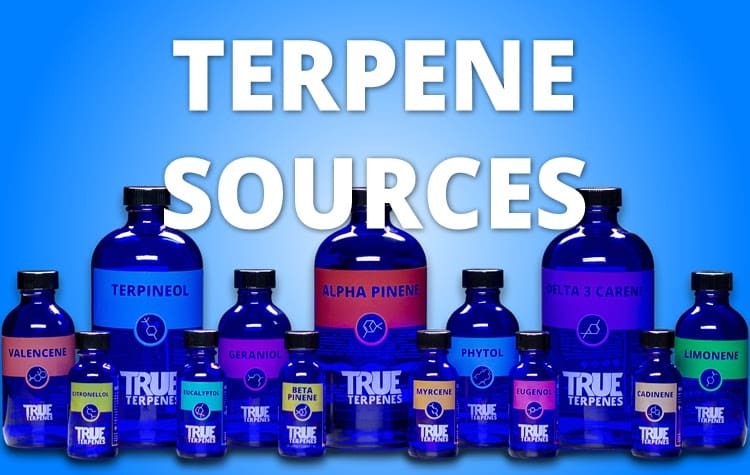 For additional information or consultation about what kinds of terpenes are best for your products, connect with one of our knowledgeable sales team members at sales@trueterpenes.com. What Are The Benefits Of Beta Caryophyllene?What Are The Benefits Of Linalool?